Tonight on TNT is an all new episode of Dallas. On tonight’s show our favorite villian J.R. Ewing returns to Southfork. Last week was the season premiere, if you missed last week’s show, we have a full and detailed recap here for you. 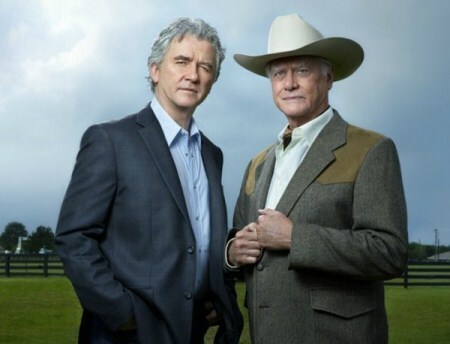 On last week’s show, poor J.R. (Larry Hagman) was is in an assisted living center, but that didn’t last long when he found out his son John Ross Ewing (Josh Henderson) wanted to drill oil on Sourthfork property, there was no way J.R. was going to miss that one; he had a miraculous recovery, greed and scheming led the way! Meanwhile, Bobby (Patrick Duffy) is his same old self, now married for eight years with a new wife Ann (Brenda Strong) and still living at Southfork. Bobby’s son, Christopher (Jessee Metcalfe) returned from Asia with his fiancée Rebecca and they were married in the season opener. Christopher’s thoughts for the family business is in a completely different direction than John Ross, he wants to take it in a new direction of alternate energy resources. John Ross is dating Elena, Christopher’s former fiancee and you can just imagine the friction between the three. Actually, Christopher married Rebecca knowing that he still had feelings for Elena. Sue Ellen (Linda Gray) has problems of her own when John Ross blames her for Cliff Barnes running Ewing and had she not sent him to a boarding school, his father would have been able to teach him the business. Sue Ellen tells John Ross to put that all behind him, she can now be an ally, she can help him and she may just be the next governor! On tonight’s episode, J.R. moves back to Southfork which doesn’t sit well with Bobby’s wife Ann. John Ross is on a mission, the impress his father. Cliff Barnes is back and he wants to renew his relationship with the Ewing family and connect with his nephew. Hold on to your hat because some stunning family news is going to be revealed tonight! Stay tuned for our live coverage of the show tonight at 9PM EST! Meanwhile, while you wait hit the comments and let us know if you are are enjoying the series “Dallas 2012”? RECAP: J.R. is getting a shave, his son John Ross as well. He tells John Ross that when he was eight years old he told his daddy he wanted a horse and replied that when he had J.R. had the money he would sell him one. J.R. is finished shaving, tips the two barbers and little does John Ross know that J.R. now has the knife in his hand and he continues shaving John Ross himself. He tells John Ross that he feared his daddy most of all, then he tells him that he went down to Mexico and he knows that Marta Del Sol is not really the “real” Marta, with the knife still in his hand. J.R. tells John Ross that he doesn’t blame him for trying to screw him because he wasn’t really a father to him and he would like to make up for that. J.R. wants his son to find it in his heart to forgive him and they shake hands, then they hug. First things first, J.R. wants to meet the real money man. John Ross reveals that Lobell is blackmailing him. J.R. tells him to give Lobell just enough to shut him up. J.R. tells John Ross that Lobell is not the problem, it’s his son who has a problem with driving and drinking, he killed a women and they paid off the only witness; the oil industry runs off two things, drilling mud and information, J.R. tells John Ross to get that information. Ann tries to show Rebecca how to shoot a rifle, but she’s not comfortable with it. A ranch hand named Tony (Rebecca’s brother) happens by and when Ann gets a phone call she leaves and Tony offers to drive Rebecca back to the ranch. Tony wants to know if Rebecca found out anything about what research Christopher is doing, she claims to know nothing. Tony gives her some device to put in Christopher’s computer to copy the data. John Ross introduces the “money” people, a Venezuelan oil man, to J.R. and he wants to make something clear, after they buy Southfork from his brother, they will convey that property to J.R. and his son for 14% of all profits received from the oil in their wells. The deal was supposed to be 15% and these people don’t seem happy about it. They are fronting $50 Million for oil reserves that estimate over 2 billion barrels, if that oil should stop flowing to them for any reason, that would be unacceptable. J.R.’s response, the best way to understand him is to talk to his friends and enemies; his friends are in the state house, his enemies are harder to find. They shake on a deal, 14%. J.R., Marta and John Ross leave, J.R. has a private moment with Marta and tells her that he will accept being double dealed once, but twice, that is something he will not accept. Bobby is at the doctor with Ann for his cancer. Ann convinced herself that surgery was going to solve everything, but Bobby has to go through chemo and Ann is worried about the side affects. John Ross drops of cash to Lobell who is surprised not to find his two million. Lobell reveals that he just got a phone call from Bobby, he is putting the sale of Southfork on hold permanently. At the ranch, Bobby gets a phone call from J.R.’s doctor, he wants Bobby to have J.R. spend time around the family home because it would be good for his therapy. Ann is gone to make up the guest room, Bobby doesn’t want the rattlesnake in the house. Meanwhile, J.R. and John Ross were with the doctor, they promised him a date and a dinner in return for him convincing Bobby to let J.R. back into Southfork. J.R. vows to John Ross that he will get Southfork back because he should not pay for his father’s sins. Christopher is working with Elena and when Christopher comes up with an idea the two share a compassionate hug. Just then Rebecca calls Elena, she invites her to lunch. J.R. arrives at Southfork, there’s no welcoming party but he does find Cliff Barnes in the office with Bobby. Cliff just stopped by to say hello and teases J.R. that Bobby was going to sell Southfork to him. Rebecca and Elena are at lunch and she drills Elena on what kind of child Christopher was. Elena tells her that Christopher found out he was adopted, he felt he had to worker harder to prove himself because Ewings don’t fail. Lunch is done and Rebecca goes to see Christopher and tells him that everything is ok between her and Elena now. The doorbell rings, a man tells Christopher that Cliff Barnes has invited him and his wife to dinner, the car is outside. Rebecca thinks it’s a nice gesture, Christopher knows Cliff wants something. They go meet with Cliff who tells Christopher that he misses his family. Christopher doesn’t believe it because Cliff has spent the majority of his life trying to destroy the Ewings. Cliff wants to invest in Christopher’s company and he has a suitcase filled with a million dollars to prove it. Chistopher realizes that this is not about helping him, it\s about screwing his family. The next day, Ann is in the barn and she hears a noise, she gets the shot gun and finds J.R. inside. He tells her that bullets don’t have an affect on him (that’s hilarious). The two look at family pictures together and J.R. reminisces about the past. J.R. goes on to tell her that it was a good idea for Bobby to sell Southfork. J.R. is with John Ross and he tells him the truth his daddy never told him, “nobody gives you power, real power is something you take”. J.R. gives him Miss Ellie’s journal. Tony calls Rebecca, he wants to know why he hasn’t got access to his computer yet and she claims to never be alone with it, yet it is right beside her. J.R. made breakfast for everyone, John Ross walks in with Miss Ellie’s journal. John Ross starts to reveal secrets about what’s inside and tells Bobby that it will get him his day in court. J.R. grabs the journal, John Ross tells him that he is not going to fail like he did, J.R. slaps him in the office and Bobby is shocked. Elena and Christopher are excited their experiment worked, they go see Bobby and find him in his study selling Southfork. Christopher is furious, Bobby tells him that he wants something better for him. Christopher yells him and tells him to stop treating him like a little boy, he is a grown man. Bobby asks him to sit down, then he tells him that he is going to be fine, he has cancer. They found a gastrointestinal tumour and it is already removed and now he is going to go through chemo. Christopher is even more upset that Bobby didn’t tell him, he shouts at Bobby to stop shutting him out. Christopher leaves and Elena is there to give him a hug while he cries about his dad, meanwhile, Tony is taking pictures and the two kiss. Tony doesn’t take any time to send the photo to Rebecca. J.R. calls John Ross and tells him that Bobby is selling the ranch, it worked. Lobell then tells J.R. that it’s five million dollars or he is going to Bobby with the truth. Christopher is with Rebecca, he tells her that he was confused when he found out about his dad’s cancer and Elena was there, she helped him through it. He then goes on to say that he is sorry that he has been distracted, he loves her and wants her to know that every single day of their lives. Rebecca throws the memory stick in the garbage, there is no way she is going to betray Christopher and copy his computer for Tony. Bobby and Ann are in bed, he tells her that he is fine now that he has sold Southfork. They both realize that J.R. gave that journal to John Ross but Bobby is not angry because it is just who J.R. is and always will be. John Ross is upset, the witness who seen Lobell’s son kill the women is dead, athough he has other good news, the email to Elena when she was about to marry Christopher, it was Rebecca.